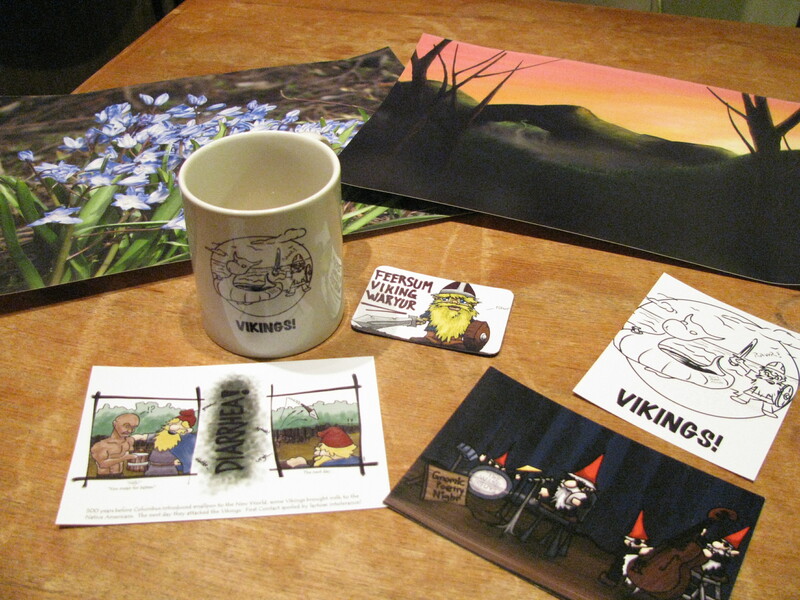 Merch and Donations | Vikings, Books, etc. More pictures are available as prints or other non-clothing gifts at my DeviantArt store. Links to a few specific prints are listed below, but more may be found at DA. The default purchase when you go to one of the pages for the prints is the large, expensive fine art or canvas print– so unless you want to pay for that, be sure you check further down in the right hand column for the other options! Some of my pictures won’t actually work well as large prints, so I’ve tried to remember to disable that option for most of these. In order to make a purchase, I believe you will have to create a DeviantArt account–but this comes with no obligation (it is free and you don’t have to post any art! ), so just think of it as creating a membership at an online store. Downloads of many of my pics are also available on DA, so check out the normal (non-store) gallery for those! on November 28, 2013 at 11:09 am | Reply New Store at Redbubble and Sale at DeviantArt!!! | Vikings, Books, etc. Hello. How about writing a guest post with links to your resources? Hey, sounds interesting–I’m a bit swamped with work at the moment, but you want to try emailing me and see if we can work something out? I’m not sure whether it works or not, but try vikingsbooksetc [at] gmail [dot] com. If you don’t hear back from me, try contacting me here again–I haven’t had anyone use this email address yet. I’ve sent you an email, not sure if it went through. Hm, yeah, I didn’t get it–I must have set things up wrong (it is supposed to forward to my other email address). Try callego [at] gmail.